This front change machine is recommended for the Car Wash and Laundry Industries. thicker cabinet, a thicker pry-resistant recessed door, and boasts dual locks for added security. It uses a hopper that holds 2,400 Quarters or Tokens, and it can be equipped with your choice of a "Change" or "Tokens" front. This model also allows the use of a wide range of Industry-Standard Bill Acceptors. 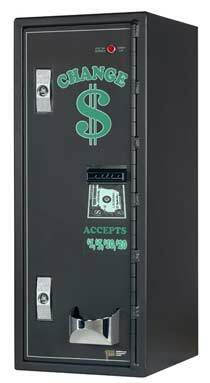 It is equipped with a Pyramid Validator that accepts $1, $5, $10 and $20 Bills and has a 500-note stacker.